Universal Studios in Orlando is a great alternative for entertaiment specially for teen and young adults, off sourse without excluding families with little children and seniors. The desing of the theme parks inspired on the film industry and adventure creates a special interest on the demographic gruop initially mentioned. A lot people lately ask for Universal Studios ans Island of Adventure since the Theme Parks add the Wizardling World of Harry Potter. On your next vacation to Orlando Florida and its Theme Parks your will find a wide selections of theme park in which you have the option of paying the full price admission that is already 4117 doolars for 1 day per person and when traveling during the peak season is $132, $15 dollars more than usual. You can take advantages of different marketing planes in which you and your spouse can participate a get a great discount on your admission that could be around $39 dollars for the same admission. At least for Universal Island of Adventure during the second semester of 2017 Orlando Discount Tickets USA offers are several ways to save money on your next vacation trip. When it comes to planning a trip to this popular Orlando vacation destination, travel insiders all report the same thing – never pay full price when purchasing Universal Studios Florida vacation packages which with our company start at $169 dollars including hotel accommodation at the Baymont Inn Hotel and at least the admission for the first 2 people for one day of theme parks. The discounts can be find at Universal Studios Discounted Tickets so you take advantage of save on your trip or keep room in your pocket to also enjoy other kind of entertainment in Orlando. Purchasing tickets for Universal Studios as many toursit believe is not something dificult, you can buy tickets at the gate of the park which is not recomended when is peak season because the lines can tak ebetween 30 y 40 minutes , you can purchase tickets on the Universal Website but be careful do not price the Florida Resident Price, you can nuy also tickets at different booth or hotel concierge but they always charge a convenience fee between 8 and 10 dollars per ticket. The last and probably most recommended way of getting tickets at disocunted price is with Orlando Discount Tickets USA where the admission for 1 day start at $29 dollars and requiere your participation in a sales presentation one of the day you are in Orlando. In some cases, you can purchase an entire package that includes a great room, big time discounts on food and smaller attractions in the areas, and great deals on tickets that allow you to enter the park before those who aren’t staying on the property. In some cases, you can also get tickets that give you the ability to jump ahead of the big lines for rides! These deals are much better than if you were to book a hotel room nearby and walk up to the gate for tickets, but not everyone knows about them. By planning ahead and really exploring your options, however, you may be surprised by everything that you can get for your money. For those who are looking for ways to stretch their dollars in Orlando this year, discounted Universal Studios Florida vacation discounts trough a resort preview are the safest way to go to make the most with your money. For the beginning of June the Volcano Bay Water Park will be also opened and the parks that will complement the Universal Studios entertaiment. The admission at the gate is $67 dollars and you can include this great theme park on our promotions bu calling 18002306991. 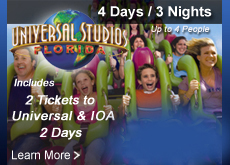 Visit www.orlandodiscountticketsusa.com to discover tickets promotions and vacation packages for Orlando Florida. Universal Studios Resort in Orlando has release the official opening for Volcano Bay Resort Water Park on June 1st, 2017. This water park definitely will be like no other and has new elements as the result of extensive marketing research base on customer experience around the wolrd. Orlando Discount Tickets USA update the information regarding this major attraction that for the local is already evident with the construction of the big Volcano that we all see while driving the interstate I 4. The new Universal Studios Volcano Water Park replaces Wet’n Wild Water Park that for year was the favorite of Orlando Residents due to the great promotions and well know for the multipersons ride. Volcano Bay occupies 30 acres of a very innovated experience because is it already designed hassle-free and it is intensive on the concept of what people really loves of wáter park, but also wht it doesn’t like to make the perfect offer for the visitors. The Center Piece of Volcano Water Park which is Krakatau Aqua Coaster which is a Canoe Water Coaster will take guest through the 200 foot-tall Krakatau Volcano. For the visitor to enjoy the ride the water park has available boarding canoes to travel both down-and uphill. On the coaster will be darkness and light and fun waterfall as the guest go through a mysterious Island. The waterfall of Krakatau Aqua Coaster will feature a 170-foot waterfall. Ko’okiri Body Plunge: a Racing 70-degree drop that will plummet 125 feet. Ta Nui Serpentine and Kala Body Slides: Here you will fall freely along 124 tisting feet. Punga Racers: Enclosed slides featuring manta-shaped mats. Waturi Beach: Sparkling, multi directional wave pool where you can swim, relax and even have a private cabana. River Villages: Tot Tiki Reef: Toddler play Area with spraying Maori fountains, slides a kid-size volcano. Kopiko Wai Winding River: A gente, winding river that passes trhough the volcano’s hidden cabanas. Maku, Puihi: Both are multipassengers raft rides. Ohyah and Ohno Drop Slides: Twisting, adrenaline-pumping slides that launch you four or six feet above the wáter at the end. Taniwha Tubes: Easter Island-inspired slides with rafts. Puka Uli Lagoon: Tranquil pool. Because you don’t want to miss this experience for the next summer of 2-17 start planning your vacation package including Volcano Bay Universal Water Park. Your vacation package is posible at discounted price with Orlando Discount Tickets USA with packages for Universal Studios starting at $169 dollars for the entire package. 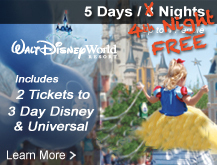 Visit www.discountticketsusa.com to discover affordable options of vacation to Orlando Florida.